Editor & Publisher, Shoptalk: Jim Haught’s ‘One decision doomed a vital paper’ in Charleston W.Va.
We at West Virginia’s largest newspaper, the Charleston Gazette-Mail, have learned how a single unlucky decision can destroy a dynamic paper. In 2003, the conservative Ogden chain offered $55 million to buy the afternoon Charleston Daily Mail, longtime partner of our Charleston Gazette in a joint operating agreement. Rather than let Ogden take over, Gazette owners—mostly the Chilton family — borrowed $31 million and dipped into reserves to match the Ogden bid. The step triggered a death spiral that finally put the combined Gazette-Mail in bankruptcy—and left Ogden, ironically, poised to acquire both Charleston papers for a mere $11 million. However, bidding on March 8 gave the combined Charleston paper to owners of the Huntington Herald-Dispatch. After the 2004 Daily Mail purchase, the U.S. Justice Department sued, claiming that the Gazette paid $55 million for the smaller afternoon paper in a plot to extinguish it and divert all local print advertising to the Gazette. Three years of expensive litigation ensued. Next, the relentless collapse of print advertising left the paper unable to meet payments on the heavy debt incurred in the Daily Mail acquisition. An additional $6 million was borrowed. Owners defaulted on staff pensions, letting the federal Pension Benefit Guaranty Corp. assume them. In 2015, Gazette and Daily Mail newsrooms were combined to produce a single Charleston paper, the Gazette-Mail. Eventually, Monday print publication was halted. And the staff was downsized. Despite all cutbacks, loss of ad revenue wiped out the paper’s ability to meet debt payments. The red ink worsened when the former Daily Mail owner, MediaNews Group, won a court judgment for unpaid management fees and $1.5 million for sale of the Daily Mail’s website address to the London Daily Mail. Buffeted from all sides, the Gazette-Mail filed for Chapter 11 reorganization on Jan. 30. This disaster wouldn’t have occurred if the Gazette hadn’t plunged deeply in debt in 2004 to match Ogden’s $55 million offer for the Daily Mail. Last year, the Gazette-Mail earned $1.5 million more than its basic operating costs — yet it couldn’t meet its backbreaking debt payments. A newspaper is a living thing — and it’s tragic for the Charleston Gazette-Mail to fall victim to ruthless economic troubles that are ravaging print journalism. I’ve been here 67 years, chiefly at the Gazette, while the paper waged endless struggles to keep government clean and improve life for West Virginians. During the corrupt Barron administration, the paper revealed that Barron insiders created a network of phony corporations—merely mailboxes—in several states. Federal prosecutors proved that the maildrops received bribes for state contracts. During the corrupt Moore administration, the Gazette revealed an array of shady dealings. Gov. Arch Moore went to prison, like Gov. W.W. Barron. After fiery W.E. “Ned” Chilton III became publisher, he hammered what he called “sustained outrage” to achieve reforms. Back in the 1960s, he championed racial integration to wipe out Jim Crow segregation. The Gazette fought constant battles. For example, when a 14-year-old boy took a pistol to school and killed a classmate, state law forbade anyone to reveal the juvenile killer’s name. Chilton defied the law and printed the name. The county prosecutor, a petty politico who had been exposed by the Gazette, indicted Chilton and two staffers. But the newspaper fought all the way to the U.S. Supreme Court and won the right to name juvenile murderers. In the past, the old “commissioner of accounts” system let well-connected lawyers take cuts from estates of dead people. Chilton fought for years until the “ghoul system” was abolished. He decided that the Kanawha Valley needed a 911 emergency calling center for fast dispatch of police, firefighters and ambulances. He pounded the plan so often that reporters in the newsroom chanted “9-1-1.” He won, and today’s Kanawha County call center is named for him. The Gazette filed lawsuits that forced the State Bar to reveal ethics complaints against lawyers—and the state Board of Medicine to disclose malpractice complaints against doctors—and all public agencies to reveal lawsuit settlements caused by officeholder wrongdoing. Chilton sent reporters to dig into abuses by stock promoters, charity executives, evangelists, roofers, termite exterminators, house siding salesmen, insurers and car dealers. The latter temporarily canceled $100,000 worth of newspaper ads in retaliation. On and on it went. After Chilton died in 1987, the paper continued his hard-driving strategy—winning many national awards until Statehouse reporter Eric Eyre won a Pulitzer Prize last year for exposing outrageous flooding of West Virginia with deadly opioids by pharmaceutical firms. Ned’s wife, Betty, and their daughter Susan struggled intensely to keep the paper solvent as ad revenue disappeared—but in the end, it wasn’t possible. James A. Haught is editor emeritus of the Charleston Gazette-Mail. 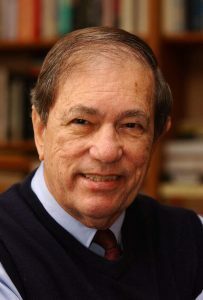 During his six decades working in newspapers, he has been a police reporter, religion columnist, feature writer, night city editor, investigative reporter, associate editor, and editor. He continues to work full-time at age 86.